suppose them to be incapable of exact representation by ordinary musical characters. It is found, however, that they all submit to the laws of musical language, and if sung or played exactly as written, all the charac�teristic effects will be reproduced.�Theo. F. Seward. 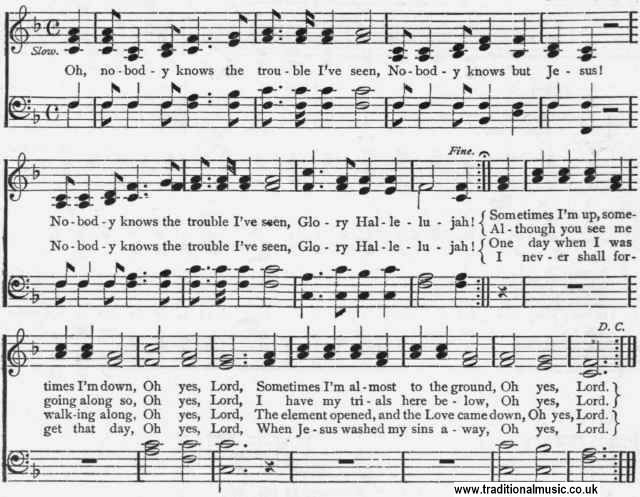 The song given above, is a favorite on the Sea Is�lands, off the coast of South Carolina. Once, when ill-feeling was excited and trouble anticipated because of uncertain action of the Government in regard to the confiscated lands on those islands, Gen O. O. Howard was called upon to address the colored people. To prepare them to listen, he requested them to sing. At once an old woman on the outskirts of the meeting began," Nobody knows the trouble I've seen," and the whole audience.joined in. The plaintive melody: and the apt refrain of the rude hymn, produced an effect that can never be forgotten by those who heard it sung.